When Miles Davis recorded the soundtrack for Louis Malle’s nouvelle vague classic Ascenseur Pour L’Échafaud his group improvised almost freely (Davis just predefined some chords and the tempo) while watching the film sequences simultaneously, then a revolutionary approach. This album here works the other way round, it is freely improvised as well and the titles refer to Werner Herzog’s seminal auteur film “Aguirre – The Wrath of God”, a fable about imperialism and hubris starring the megalomaniac but brilliant German actor Klaus Kinski. The names of the tracks were added later but nevertheless the music works as a soundtrack as well. Brigantin is the working title for another meeting organized by Jean-Noël Cognard for Bloc Thyristors. With Johannes Bauer (tb), Conny Bauer (tb), Barry Guy (b) and himself on drums Cognard got some of the best European free improvisation musicians and the result is European old school free jazz at its best. The Bauer brothers are simply great instrumentalists, absolute masters on the trombone, who are able to play the weirdest scales and riffs. In combination with Barry Guy, the godfather of British free jazz bassists, and Jean-Noël Cognard’s drumming, which is obviously influenced by Paul Lovens and Paul Lytton, this is a perfect match. Structurally the album is framed by three quartets, the other six build the backbone of it and, being surrounded by solos, duos and trios, they are the musical and compositional highlights. 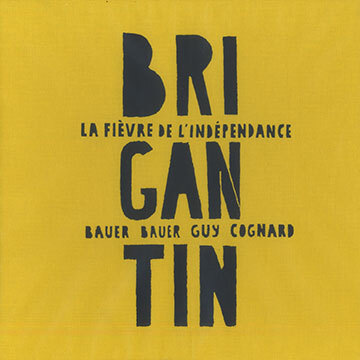 The first two, “Esclandres et troubles” and “Haut-Fonds”, symbolize the riots and troubles and the shallow water the expedition has to deal with, while the final track “Répandues à profusion” is held together by Conny Bauer’s trombone riffs so that the others can improvise freely. It is indeed a widespread profusion of notes and sounds, but it is not idyllic, it is a hostile nature where man is lost (in the last and most famous scene Aguirre/Kinski is the only survivor on his raft explaining his conquest plans to a bunch of squirrel monkeys). The album is full of a variety of dark sounds: honking, gurgling, cawing, panting - it is the soundtrack for a doomed mission. Other favorites are “Tractations”, a splendid trombone duet by the Bauer brothers, who seem to be wrestling playfully with each other as they might have done in their childhood days (one of the more blitheful moments on this album), and the Barry Guy/Jean-Noël Cognard duo “Les bateaux se disloquèrent”, a torrent of flageolets, wild bass runs, sawing and sophisticated drumming including extended material, where you can literally feel the panic of the expedition in the film when their boats were swept away by the floods. These three LPs come as a limited edition of 300 copies, two LPs in yellow and one in clear transparent vinyl. The music was recorded in 2012, studio and live, and the album includes a series of photos from Philippe Renaud. Any idea how one can purchase this set? Although you have to pay shipping costs it is worth it, since the box itself is relatively cheap here. I bought it at my local seller in Munich. Martin - Grüß Gott - thanks for that, but I’ve already ordered it through Tony at Instant Jazz, who’s proved reliable in the past. that was exactly where I bought my copy. Ludwig Beck is a great store and I can recommend it to everyone who visits Munich. It has great jazz and classical music departments. Ernst Nebhuth, who is the head of the jazz department, is one of greatest free jazz experts I know. It's nice that you found a copy on instant.jazz, which is a very recommendable seller as well, of course. This box - recommended ! - is released on the private label of Jean-Noel Cognard: jean-noel.cognard@wanadoo.fr. I must buy it now !